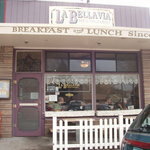 Description: A cozy, downtown gem in the heart of Flagstaff's Historic Southside District, La Bellavia has been serving Flagstaff delicious homemade breakfast and lunch since 1976. 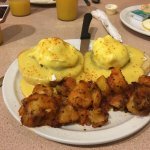 The menu features specialties such as a made-from-scratch pancakes, popular eggs benedicts, such as the Beaver Street and the Jesse, and mouth-watering sandwiches such as a turkey melt with green chilies and a classic corned beef reuben. La Bellavia proudly serves locally-roasted coffee and local art adorns the walls. We arrived early on a Sunday morning via Amtrak, we arrived in the at 6am. This restaurant opens at 7 am on Sunday, so we walked over right when they opened. The waitress was friendly and pleasant. The food was tasty. There were 4 of us, we had the veggie scramble, the trout Benedict, trout with eggs and breakfast burrito. There was plenty of food, the service was excellent. We would come here again. Excellent hollinaise on very good eggs benidect prepared many ways. We have eaten here several times over a week. Lunch is also good with homemade soups. Better than the higher rated coffee shop next door for breakfast and lunch. Also have espresso drinks. Would recommend to friends and family and plan on going back my next trip to Flagstaff. We ate breakfast here today based on a recommendation in the guest book at the Hotel Monte Vista for Eggs Benedict. They have numerous selections of Eggs Bene. You get 2 poached eggs on English muffins topped with what ever you can imagine(almost)! If that is too many carbs, you can ask for fruit. My husband ordered the Italian Eggs and enjoyed them. I had the Neptune Eggs Benedict and they were yummy. The hollandaise is delicious and plentiful. If you don't want the eggs completely covered with the sauce, ask for it on the side. Michelin 2 Stars for sure! Been to La Bellavia Restaurant? Share your experiences!